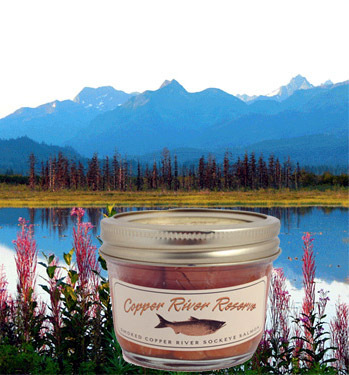 Copper River Smoked Sockeye Salmon Fillets - Award winning, all natural, alder smoked, Wild Alaskan Sockeye Salmon from the Copper River. Wild caught, renewable, sustainable...slow smoked salmon. Considered one of the world's finest seafoods, this smoked Copper River Sockeye salmon from Alaska has unequaled flavor & is Alaska's finest! The mason jar displays the deep red color of this superior smoked salmon! 100% all natural Alder smoked wild Sockeye salmon from the pristine water of Alaska's famous Copper River are known world-wide as the highest quality & best tasting smoked salmon. Tasting is Believing...welcome to the savory world of seafood! Smoked Copper River Reserve Wild Alaskan Sockeye Salmon Fillets. Size: 7 oz. Glass Mason Jar.